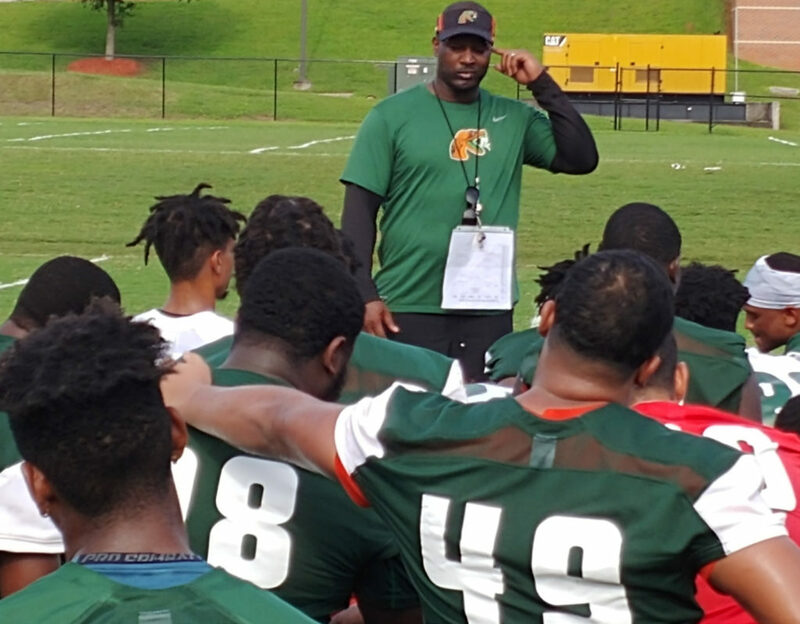 FAMU’s football players went through about two hours of drills on their second day of practice Saturday. Coach Willie Simmons reminded his player that the upcoming days of practice will get tougher. James Spady, associate head football coach at FAMU, was at the 220 Quarterback Club weekly luncheon to discuss special teams. Then, he made a statement about what it takes to build a winning football program. That set off a firestorm of questions about Kayvon Thibodeaux. “If you could get great players, your job is halfway done,” said Spady just before Thibodeaux became the conversation for a good 15 minutes. Thibodeaux is the No. 1 high school player in the country who is being sought after by at least five major schools, including FSU. He set social media afire when he took a recent unofficial visit to FAMU, doing an extensive tour of the campus. 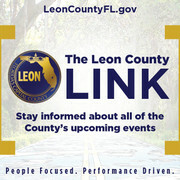 He also took in a step show, visited the Hansel Tookes Recreation Center and the Gaither House. The odds that Thibodeax, a senior at Oak Christian in Los Angeles, will settle on FAMU next signing day are very low. However, if he doesn’t become a Rattler, Spady said FAMU has already scored a victory by his tour of the campus. In every post, Thibodeaux mentioned how much he was enjoying his first experience of being on a HBCU campus. He encouraged everyone considering college to do the same. “I’d bet you if you asked him right now, he would rather be at FAMU than anywhere else,” Spady said. He was realistic, though, noting that FAMU and other FCS schools are at a disadvantage against Power Five teams, when it comes to players of Thibodeaux’s caliber. Nonetheless, his visit seemingly was great advertising for FAMU. 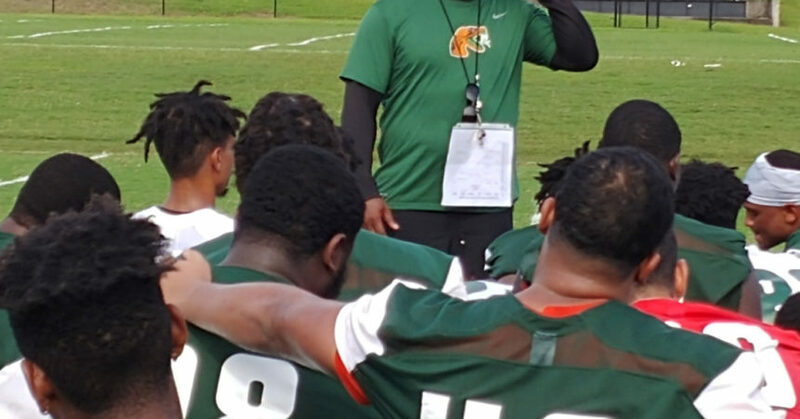 “I’ve never seen the hash tag FAMU used so many times as I’ve seen over the last three or four days,” Spady said without mentioning Thibodeaux’s name. “What’s this is going to do, whether we get this young man or not, is going to create influence to get the ones that we should get. As for the main reason Spady, who was head coach at Alabama A&M before coming to FAMU, was at the luncheon, he had a lot of praise for special teams. Especially when it comes to the kicking game. Spady also disclosed that head coach Willie Simmons had changed the way that special teams is coached. Simmons later said after Saturday practice the change is intended to put the same emphasis on special team as any other unit of the team. Essentially, each phase of special team has a separate coach. “You look at the offensive side of the ball and there are five coaches coaching 11 guys, look at the defensive side of the ball there are five coaches coaching 11 guys,” Simmons said. “So if you turn around to special teams, it’s still 11 guys on the field. The fact that special teams could win or lose a game can’t be underestimated, Simmons said.